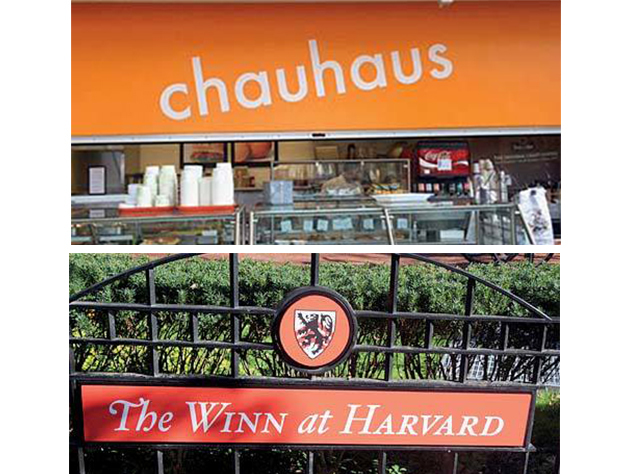 During their diaspora while their permanent digs are renovated this year, Winthrop House residents inhabiting one of the swing spaces found their interim home dubbed “The Winn at Harvard,” a bow toward the Inn at Harvard formerly operating there. Primus encountered this new sign, and rediscovered some amusing ones, on clement autumn walks through campus. For instance, the Graduate School of Design café, Chauhaus, nods to history, too: a cheeky reference to the Bauhaus and Walter Gropius, whose flight from Nazism brought him to Cambridge, where he famously chaired the school’s department of architecture. But no antecedent comes to mind for this HBS sign. During the demolition of Kresge Hall and its replacement with the now-opened Ruth Mulan Chu Chao Center, executive-education students and others were accommodated at a temporary (but very nice!) dining facility sited between the dean’s house and Burden Hall (soon to be razed, too). With food service permanently relocated, this amenity is now in place. It is unknown whether M.B.A. candidates find it relaxing, or another venue for exercising the competitive invisible hand of capitalism. Turning to different signs of the times: in the climate-change sense, Harvard is becoming ever greener . But the physical campus is, ironically, becoming less so, visually. To combat an infestation of rodents, significant bits of landscaping have been ripped out, thinned, or cut back of late. In the Yard, the ivy and shrubbery alongside the staircase descending from Lamont Library to Wigglesworth has largely given way to mulch. A small bulldozer uprooted the groundcover around Boylston early in the fall semester; dreary mulch and riprap are now in place. The faunal eruption may reflect disturbances from construction; others speculate that a warmer climate has enabled critters to survive winter better; and still others point to more expansive food service, and the litter from picnicking visitors who use the common-spaces seating available fall and spring in the Old Yard. Those visitors and tourists have definitely compacted the soil more, and age and weather have taken down some landmark trees: one beside Mass. Hall and Matthews, a giant tulip poplar at Barker Center. Finally, the greens themselves have altered the scene. Some of the turf in front of Emerson, facing Tercentenary Theatre, was paved to accommodate bicycle racks, which also uprooted hollies at Warren House, with unfortunate, asymmetrical effects. Winter will surely give way to spring green—but less green than would otherwise have been the case. These were unsettled times (the French and Indian War was under way), but the connection between guns and prayer, if any, is not clear from the records.